New Home for Sale in Louisville: 1910 Bonnycastle Ave.
Classis Highlands home in PRIME location with 2-CAR GARAGE! 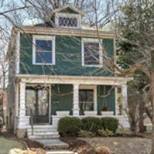 Enjoy warm summer nights from the charming front porch on this darling home located within an easy walking distance of the restaurants and shops of Bardstown Road/Cherokee Park. This home features all the character of a vintage home, het has a newer roof, siding, and the majority of the windows have been replaced. Dual a/c units keep the house comfortable on both levels during the upcoming warm weather. An entry foyer, comfortable living room, and grand formal dining room are featured on the first floor, along with a cheerful kitchen and charming sun porch overlooking a privately fenced backyared. The 2nd floor features three bedrooms and an updated large bathroom. An easy walk to a Farmer's Market on Saturday mornings! To schedule a showing of this house or for more information, please contact Scott or any other team member at Family Realty at 502-458-4100 or visit us at www.ViewLouisvilleHomes.com today!